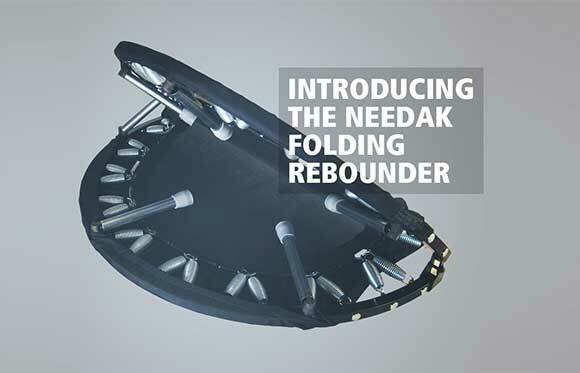 Welcome to Needak.com, an Official Needak Rebounder store. Here you will find information on the sport of rebounding, read reviews, the health benefits, and the guaranteed lowest price on every model of rebounder trampoline we at Needak offer. We offer unparalleled quality and quick shipping on all our rebounder trampolines. As the largest retailer of the bestselling rebounders in America, we deal direct with the manufacturer to offer you the cheapest pricing, guaranteed. Our patented soft-bounce springs along with permatron mats and high gauge steel frames outlast bungee solutions and will not need to be replaced for years, even with heavy use. Take a look at our bestselling rebounders at the Needak Rebounder store where you will find both our soft-bounce and hard-bounce rebounders. Unique to the patented soft-bounce mechanism of our rebounders, when you jump up and down on a Needak rebounder trampoline, you force your entire stabilization system to compensate for the force of gravity. By doing this hundreds or thousands of times, you not only tone muscles throughout your body that would otherwise be ignored, your central skeletal system is strengthened through minor isometric actions. This assists in targeting hard to reach muscles, such as your core abs, your neck, shoulders, and even your throat. Users that snore have reported positive results from long-term rebounder use as it strengthens your throat muscles in a manner that could assist in keeping the air passages open during rest. Not only does bouncing on a rebounder trampoline help target hard to reach muscles, but it works on your larger ones as well, such as thighs, arms, legs, calves and more. By forcing exponential gravity against your whole body, every muscle that you use to keep yourself standing is forced to contract and expand, supporting growth and energy recycling. By bounding up and down on a rebounder, you force your lymph nodes to pump and flush your system more vigorously, causing a full body detox nearly every time. This is why some new rebounder users get heat flashes early on, while veterans take a bit longer to get that sweat going as their bodies are already relatively flushed. By using your rebounder trampoline at least 10 minutes a day, you trigger the natural detoxification process in your body, causing your blood to get filtered at an increased rate, removing impurities from your system, and have them flushed as is healthy. However, not only does your rebounder assist in flushing your system, but when you break a sweat, you will secrete this waste outside of your body as well, encouraging a full system cleanse. Jumping on your trampoline once a day is highly recommended if you want to minimize the toll toxins take on your body by assisting your body’s natural ability to filter your entire system and expel waste so that all your organs can operate optimally. Few exercises work your entire body on a near constant basis without over-exertion on any one joint or muscle. If you jog, for example, eventually your feet and knees begin to hurt. If you perform muscle exercises, eventually your target group fatigues and you must rest. 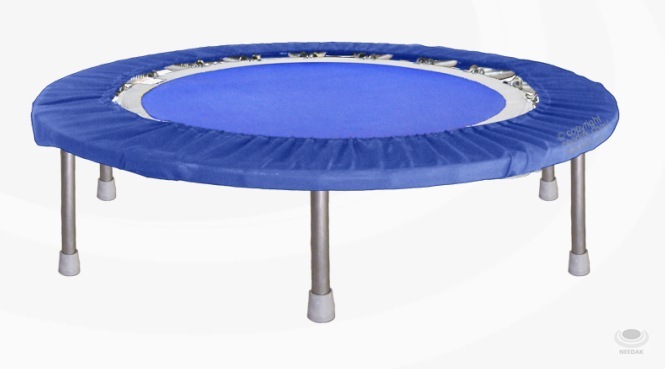 The Needak Rebounder Trampoline is unique in that you can bound on it for an hour or more (after acclimation and being safe) with no one joint or muscle being overtly exerted during the course of the exercise. This is because every component in your body is used to stabilize you as you bounce, and due to our patented spring systems (hard and soft bounce) every landing is easy on your knees, back, and other joints. By providing a soft bounce, our professional mini-trampolines allow users to use them every day, facilitating a more efficient and quick method towards toned bodies and weight loss than other, more extreme and unsustainable methods. The key to any long-term weight loss program is sustainability, and with the Needak rebounder, this is achievable. 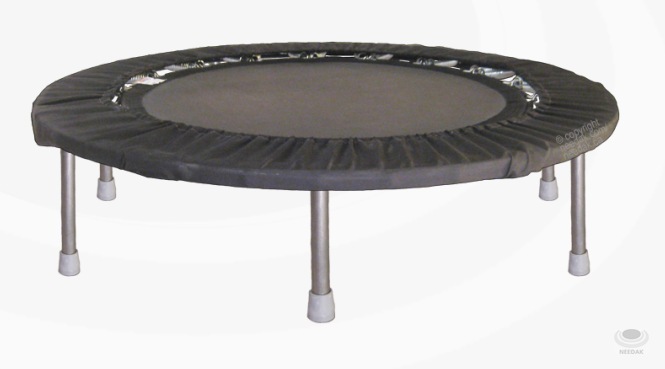 Every Needak Rebounder mini-trampoline is manufactured in its entirety in Nebraska, USA. We source US made parts and proudly maintain a level of quality control that is unsurpassed by any other manufacturer. This is why we have been outselling and out ranking nearly any other rebounder trampoline manufacturer in the world for years. Most importantly, you get our limited lifetime warranty, available only through us, unlike a used one you might buy on craigslist, eBay or Amazon. The people have spoken - with an aggregate score of 4.8/5 stars, we are rated highly by our customers, offering customers the best and most reliable trampoline on the market. Here at Needak.com you are guaranteed the lowest price on every rebounder trampoline we offer along with quick shipping direct from the factory. We additionally have coupons, discounts and promotional codes that are often available on a month by month basis. 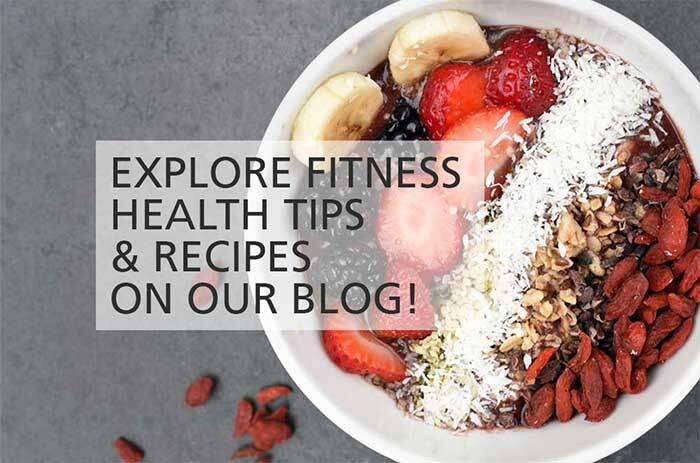 Please note that all of the health related information here is provided for informational purposes only and cannot be relied upon to resolve any health issue. Please consult your doctor prior to using any new equipment.